Nine custom PC builders compared: who gives you the best deal? At PC Gamer, we believe strongly in the value of building your own PC. It's cheaper, and it brings you closer to the hobby that we all love. But we know buying a pre-built system has its advantages, too. 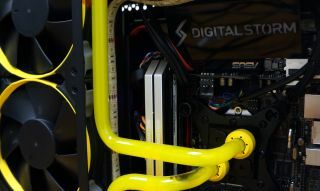 Maybe you just don't have time to build a PC of your own, or you have dreams of a custom paint job or complex water cooling you can't do at home. Buying from a professional builder also gets you warranty coverage and professional tech support, sometimes even for the life of the system. It's hard to say if the warranty price outweighs the savings it provides in repair costs, but it definitely brings peace of mind. Once you've decided to go with a professional PC builder, the next question is: which one? Some companies differentiate themselves with custom artwork, unique case designs, or good service coverage. But there are a lot of choices out there. We looked at nine professional PC builders to see what kind of warranty options, service coverage, and other defining factors set them apart from one another. Then, I built two systems for each company: a high-end system—pretty much the best the company offers—and the cheapest pre-built system available. Here's what we found. The gaming arm of Dell, Alienware is somewhat known for its expensive systems and "high-end-gaming-for-dummies" approach to service. Every Alienware system comes with a standard one-year limited hardware warranty, with additional warranties of up to four years available. High-end system warranties: $149 for two years, $219 for three years, $279 for four years of hardware and phone support. The one-year limited hardware warranty doesn't seem to cover standard phone service though, as Alienware offers a variety of "gaming services" such as new game setup, game customization and optimization, troubleshooting, and system mechanic, all at a variety of prices. In other words, you have plenty of tech support options, but they'll cost you. Tech support hours are listed as Monday - Friday from 10:00am to 7:00pm CST. Return policy is a 30-day money back guarantee, including free shipping both ways and sometimes a waived restocking fee. I'm not a big fan of Alienware's custom build system. For one, links have a tendency to sometimes bounce you between Alienware, Dell, and Alienware-branded Dell pages. It's not a huge issue, but a bit annoying and can get confusing. The bigger issue is that part options vary depending on which base model you start from. The low-end Area-51 desktop, which starts at $1,699, has a variety of video card options to upgrade to, while the top-end model (starting at $4,499) only lets you choose between triple GTX 980s or upgrading to Dual Titan-Z cards (which are now outdated with the arrival of the Titan X). Origin PC offers one-, two-, and three-year parts and free shipping warranties, excluding accessories, software, and anything damaged beyond the company's control, such as: "impacts, liquids, fire, rain, lightning or other disasters such as: nuclear war, zombie apocalypse, epidemic, alien occupation, or armed insurrection." Purchasing from Origin comes with lifetime US-based tech support that is available 24/7. Baseline warranties (included in the cost) start at one-year part replacement and 45 day free shipping. $69 extends free shipping to a year, while an additional $100 or $200 bumps the parts replacement and shipping up to two and three years, respectively. The company says it can professionally overclock systems up to 5.2 GHz, and all systems are subjected to a rigorous three-day burn-in stress test. Purchases come with a 30-day money back guarantee (subject to a 15% restocking fee), excluding custom paint, logo, or artwork services, which are non-refundable. The company ships internationally, and boasts its "wooden crate and instafoam shipping protection," which presumably helps prevent any damage during shipping. In addition to Origin's extensive color options, which will run you $250 for metallic side panels, $450 for pre-designed themes, or considerably more for custom artwork, the company differentiates itself from the competition with an upgrade service, allowing customers to return internal components of their Origin PC for credit towards the purchase of a new product. You have to buy-in to the upgrade service (it's available in a two-year and three-year format, at $20 and $40) at the time of original purchase. It covers system motherboards (on desktop form factors), CPUs, GPUs, internal hard drives, memory, and optical drives. Buyback prices are the part's current market value, as determined by Origin based on a combination of data sources. If you're planning on upgrading your PC at all in the future (which you should be), the upgrade service definitely seems worth the money. Origin's online build process was one of the best I experienced. You can customize the internals of tower builds (as in, whether you want a standard, inverted, or rotated motherboard positioning), and part selection is straightforward for both towers and small form-factor systems. Like Origin PC, Falcon Northwest is one of the more expensive options on the market, but is known for its unique, custom cases. The company uses automotive-quality paint finishes in everything from basic solid, metallic, and pearl color schemes to complex color-shifting hues and custom graphics and airbrushing. Falcon's Exotix paint starts at $756 for a solid color and goes up to $1,000 or more for complex color-shifting hues. Custom artwork, depending on the complexity, will raise that price even more. Falcon offers lifetime tech support, 9am-6pm Pacific Time, seven days a week. All desktops except the Talon include a three-year warranty which covers parts and labor (the Talon costs $195 to upgrade from a one-year to a three-year warranty), and some systems (the Mach V and FragBox) additionally come with a year of Falcon Overnight service (only available in the contiguous United States), a coverage plan that will have your system picked up, repaired, and returned via an overnight courier, should a problem arise that can't be fixed via over-the-phone tech support. With the exclusion of custom paintwork, which is non-refundable once painting has begun, Falcon offers a 30-day money back guarantee. Like Origin PC, systems are subjected to a three-day burn-in. Customers are also provided with a convenient binder of system documentation, as well as "ResuceDrive" — a USB stick that can reset your system to a factory fresh state. The Falcon "Configurator" is a bit clunkier than Origin's system, but still overall a good customization experience. The biggest issue is that you have to click into each part in order to see price differences, making it slightly more difficult to compare parts at a glance. Every Xidax computer is hand-built by a single system builder. The other main selling point for Xidax systems is the company's lifetime warranty on parts and labor for desktop systems. (Two years for laptops.) This covers the "core computer," defined as all hardware inside the computer case (excluding AMD video cards, which come with a limited two-year parts warranty, and liquid/water cooling components, which are covered for a year). Defective parts are repaired when possible or replaced with a new, used, refurbished, recertified, or comparable part. If a component is no longer supported and/or commercially available, to the point that repair of the computer would be impractical, Xidax may issue an in-store credit for the computer's then-value, instead of going forward with a repair. Xidax's return policy is a bit wonkier than most. All sales are final and as-is, with returns only at the exclusive discretion of Xidax. Returns (that are approved) within 45 days of purchase are subject to a 20% (of the purchase price) "rental fee" while returns after 45 days are charged a 20% restocking fee plus an additional $75 per day rental fee. Xidax also offers a number of financing options. BillMeLater via PayPal, GE Financing (subject to a credit approval), and a no credit check option. The third option is a terrible deal, though, as all leases are for 12 months at a rate of 20% per month. In other words, a $1000 system would cost you $200 per month for 12 months, adding up to $2400 total. Not good. Xidax's custom build UI is better than most, making it straightforward to compare prices and pick components. My only real complaint is that the menu scrolls back to the top every time you select a new component section, making it possible to lose your place and maybe forget to pick a component. iBuyPower offers a wide variety of pre-built and custom configuration options. The company's signature desktop systems come with a three year standard warranty, covering three years labor and one year parts. Four- and five-year extended warranties are also mentioned on the company's warranty info page, but they don't seem to be listed as options at the time of purchase, so you will likely have to contact the company in order to buy in. Warranties extend only to the original purchaser, and are only effective on systems purchased and operated in the United States. iBuypower does not offer international shipping, service, or sales (except for APO/FPO customers, which are covered by the standard three-year warranty). All purchases are covered by a 30-day money back guarantee, not including shipping/handling. Returns not in their original condition may be subject to a 15% restocking fee. iBuypower provides technical support 8:30am - 5:00pm PST Mon - Fri.
iBuyPower's build interface seems aimed more at someone who knows what they're doing, but still doesn't want to build their system by hand. It almost overwhelms you with component choice, yet provides little info about each part on the decisionmaking page, save for the part name and price. If you don't know what you're looking for, I could see easily getting lost in the weeds. Maingear lists customer service as its top priority. All parts are covered during the warranty period, which starts at one year on all systems then costs $99/$199 for two/three years of coverage on most systems (but the price goes up to $199/$399 on super high-end systems). Labor and phone support are free for the lifetime of the system. The warranty employs a combination of virtual on-site, remote diagnostic software, telephone support, and if necessary, on-site repair via a third-party service. Tech support hours are Mon – Fri, 10:00 am – 7:00 pm EST and Sat, 10:00 am – 5:00 pm EST. Issues within the first 30 days are additionally covered by free two-way shipping, while Maingear will cover one-way shipping after that. Systems come with a 30-day money back guarantee, subject to a 20% restocking fee, excluding shipping costs, custom work (including paint), and orders over $5,000. As for the computers themselves, Maingear says it hand-builds every system with a focus on optimal wiring for maximum airflow. Systems come with the latest hardware drivers installed (and never any bloatware), and everything is subjected to a 48-72 hour stress test. Maingear's approach seems mostly focused on providing lots of pre-configured options at a variety of price points. You can still customize those further, but based on the number of options, I imagine they're more interested in attracting customers looking for a build to suit their needs (gaming, 3D modeling, post-production, etc) rather than someone looking to hand-pick their parts. In addition to standard laptops and tower cases, CyberpowerPC offers a number of exclusive case options, such as the futuristic-looking Trinity and the briefcase-shaped Battlebox. Four years labor, two years parts extended service plan: $199. Five years labor, three years parts extended service plan: $349. Systems are covered by a 30-day money back guarantee (excluding shipping costs and custom engraving), with returns made between 31 and 45 days subject to a 15% restocking fee. No refund, credit, or exchange is allowed after 45 days. Four and five year (with two and three years parts) extended service plans are also available. While I like CyberpowerPC's variety of cases, it suffers from the same issues as iBuyPower: it overwhelms you with options without offering much info to help make component choices. I count 19 motherboard options to choose from—all X99 variations, at that—so again, if you don't know exactly what you want, it can be quite confusing. Like many custom PC builders, Velocity Micro builds its systems by hand. They are then subjected to a rigorous testing process, including a 200-point checklist, 60 cycles of testing system resources, overnight burn-in, and many others. After sale, systems are covered with lifetime in-house tech support. Standard tech support is available 11:00am to 8:00pm EST Monday through Friday, while 24/7 emergency support (covering things like boot failure, system failure, and issues that keep the PC from functioning) is available for certain warranty packages. Velocity Micro systems come with a one-year limited warranty, covering parts and labor, with two- and three-year options available, with price dependent on the system. Low-end system warranties: $99 for two years, $199 for three years of coverage. High-end system warranties: $199 for two years, $399 for three years of coverage. Sales come with a 30-day money back guarantee, subject to a 15% restocking fee. Any special or custom-ordered component (things not listed in the configuration options) are not eligible for refunds. Velocity also offers a lifetime upgrade plan, allowing users to purchase new components for their system at discounted prices. Upgraded hardware comes with an additional one-year warranty. The company's build offerings are a nice combination of pre-designed systems with the option for further customization. Digital Storm systems come with a three year limited warranty, covering three years of labor and one year parts. Four year labor, two year parts extended warranty: $99. Five year labor, three year parts extended warranty: $299. Six year labor, four year parts extended warranty: $499. Warranty service within the first 45 days also comes with free two-way shipping. Digital Storm offers a full refund, excluding shipping costs, only in the case of hardware issues and within 30 days of original delivery. Digital Storm's build interface is solid—fairly similar to Velocity Micro. Lots of choices for where you want to start out, namely case and pre-configured watercooling options, then pre-configured options that can be further customized. That's an overview of the major PC builders and what they have to offer in terms of warranties, support, overclocking, and other special services. On the next page, I put each configuration tool to the test to build a high-end rig and compare prices across all nine builders.